Former South Africa's president Jacob Zuma. eThekwini Mayor Zandile Gumede says protocols were not followed in the commissioning of a supposed recording of a music album featuring former president Jacob Zuma, and that the project therefore did not not exist. "The protocol was not followed, and we are prepared to speak on the items once we get a full briefing. For now, there is no such thing. I don't want the name of the former president dragged through the mud with something that is not existing. I want to put that on record," she said on Tuesday. According to Gumede, municipal leaders read about the so-called deal with Zuma in the news "like everyone else". "No one told us about it. Under normal circumstances, politicians make political announcements. As the ANC deployed mayor, I would have briefed ANC caucus first before making such announcements. "She was speaking at the first executive committee meeting of 2019 for the metro at the Moses Mabhida Stadium. Gumede said that media should have spoken to her or the city manager. "Whatever the media is writing, it must be from me or the city manager and not from other people. It has been all over [reports on the album] and it must be laid to rest." Parks, Recreation and Culture head Thembinkosi Ngcobo previously told News24 that the idea of the album was earmarked to go ahead after he met with the former president in Nkandla. "We were looking at artists and trying to revive these types of songs. It was very difficult. We tried to find any archived material that had video clips or any voice clips. But we could not find anything in the museums." 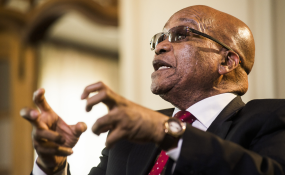 He said Zuma had a habit of singing many unrecorded struggle songs that could not be found in any archives. "We record many youth in the city. These are never questioned." He said the project was part of his department's mandate to encourage social cohesion, arts, culture and heritage.